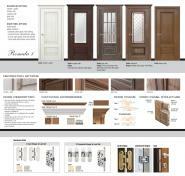 Romula 1 Door | Chestnut is made of solid wood and designed in elegant classic style. The doors of Romula are made of 100% oak wood and are very popular. Oak products are the most durable because this tree is famous for its hardness and excellent sound insulation. Purchasing doors from oak guarantee you to invest in the future. Given the modern finish, you get an interesting interior detail that adds a certain gloss. Satin Glaze - Milling Simulation is a transparent polymeric coating applied to the satin glass. Stained Glaze - Simulated Stained Glass Filled is a contour of the polymer coating and the filling layer. Facet Glaze with Rails - Facet is a technology of decorative edging. During the procedure glass or mirror facet of certain width are cut at an angle. 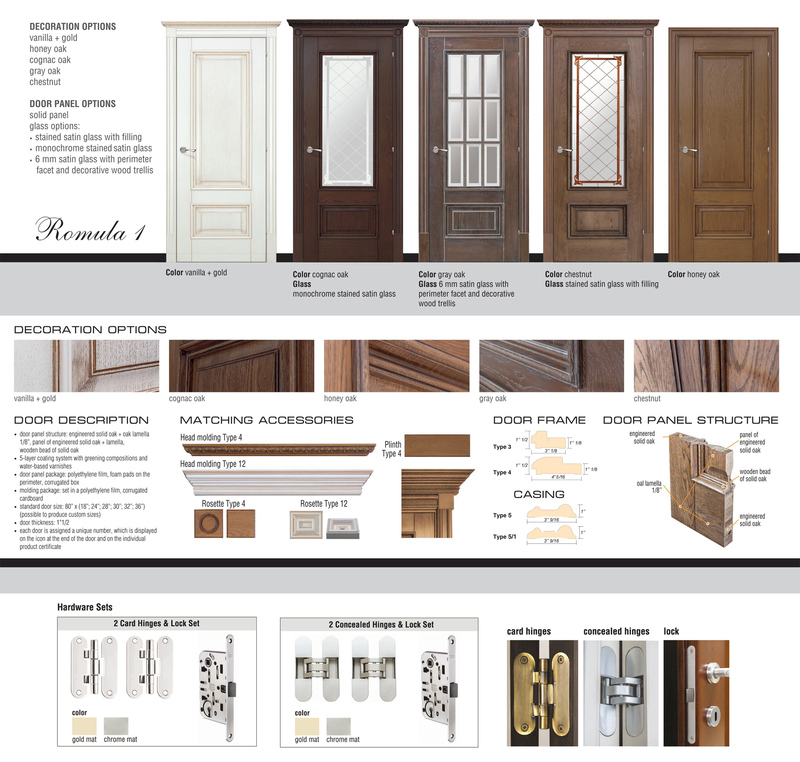 Graceful lines of glass products with facet look particularly noble and give doors a unique appearance. The finish of the door, or what usually called a carpenter, is a flat part that closes the doorjamb and space between the divider and the doorjamb. To each door, we have a restrictive appearance of the frame, and we select them considering the way that the completed look would be in agreement with the inside outline. The width of the body of the door is 3 feet and is usually less than 1 9/16 inch. In most cases, it is 8 11/16"long, which corresponds to the length of general interior doors. We had cheap hollow core doors in the house. After minor renovations that were done, we decided to change several doors damaged. We needed doors ASAP. After discussing the matter with your sales staff I understood it was a right decision. The doors purchased at your website are great!